'twas April, not the 1st but 22nd. The press release announced that "soundkaos will present their new reference speaker Libération at this year's HighEnd Munich show. We will co-exhibit with SOtM of Korea in Hall 2, stand G07. 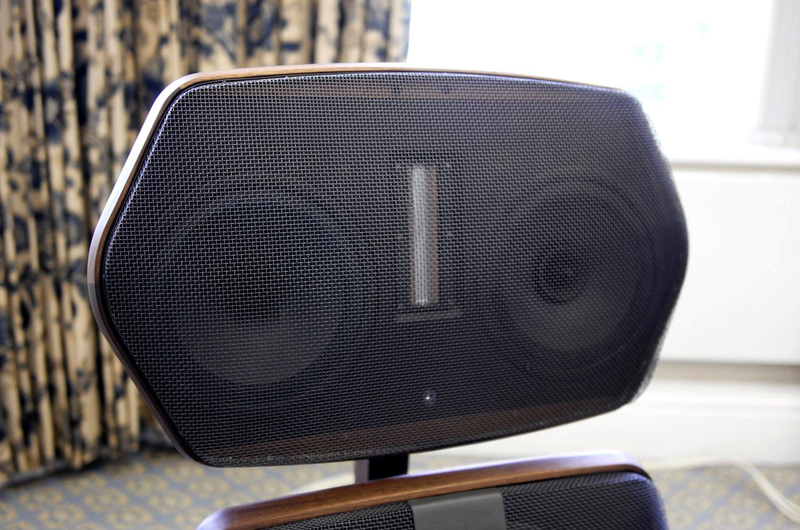 Another pair of Libération speakers will be at the Hifi Deluxe being held alongside at the Marriott Hotel from May 5th-7th. 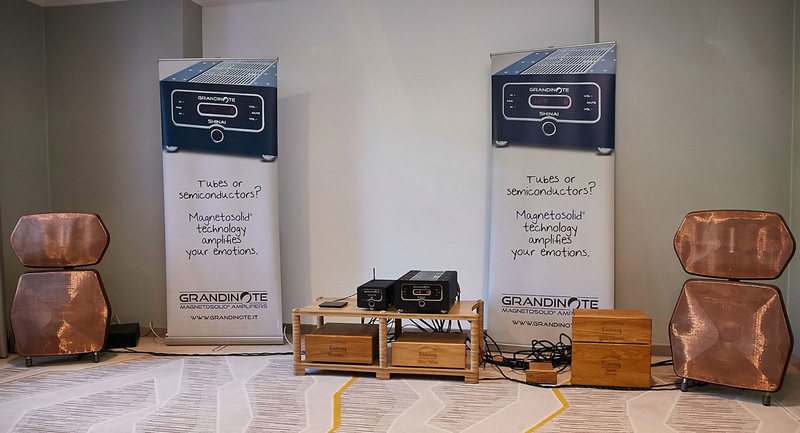 There they will demo with Grandinote server/amplifiers, Entreq cables and music by STS Digital. Libération is a completely open system with no box, hence no added colouration. With a driver array of two 8" widebanders, one dipole ribbon super tweeter plus one 15" woofer per side, soundstaging and imaging are astonishingly real. With such a large woofer, bass also has superb dimension and scale. True to the soundkaos design philosophy, this looks as good as it sounds. Where most OB designs end up with an untidy and messy derrière, our front and rear phosphor bronze mesh covers give a beautiful and elegant look." At HighEnd Munich 2016, photo credit Dawid Grzyb, HifiKnights.com, with Walter Swanbon of Fidelis AV listening. By August 27th, I was in the loop up close and personal after having had to bail on the Munich show due to our relocation to Eire a week earlier. I'd missed the first public reveal. 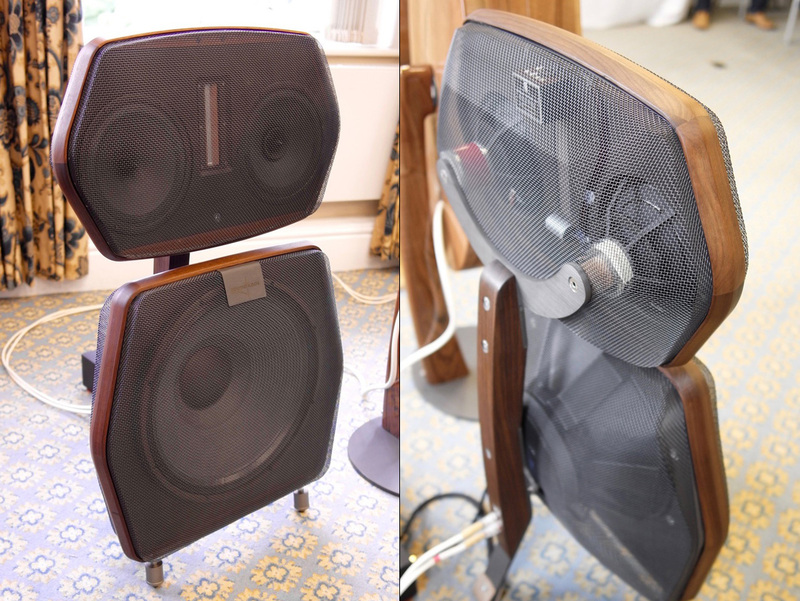 "Looking through your preview pages, it seems that speakers are flavour of the current month so I though I would chip in with a pair of Libs if you are up for a decent pair of OBs. It has been an up-and-down four months but I'm now confident that I can let them loose. I should have known by now that the last 10% are always the toughest to crack and take the longest. Strange how quickly one gets sucked into the mainstream. I've only been doing this for 6 years. There I went and made baffles out of the highest density fibreboard I could find until some listener at the North West Audio show in the UK says to me, sounds a bit flat? That's where the light went on. Where was all that tone wood I'd championed previously? Some may not like it but colouration is the spice of life. At last I got to use the two spruce tree trunks I'd bought in 2011. They'd been air dried so by now were well seasoned. And I finally cracked the bronze mesh issue. I had to custom order it which took two month to weave - well, deliver. 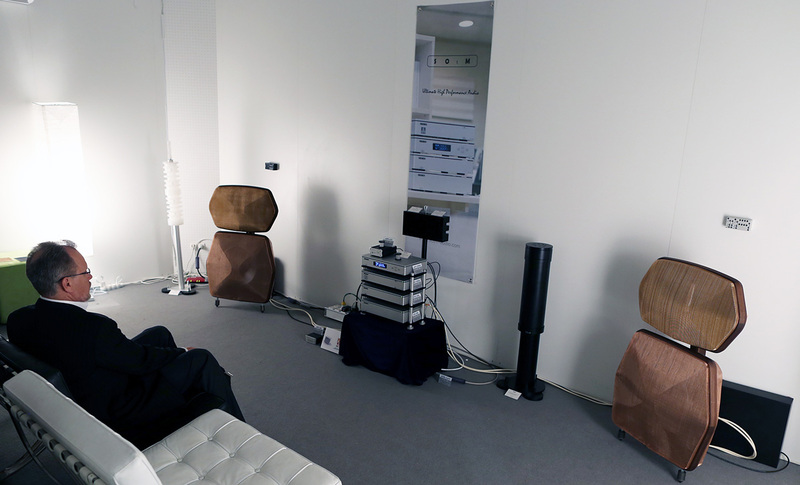 An early pair at Hifi Deluxe, 2016, photo credit Moiz Audio. "We are planning a first run at the end of September but have a few dealer orders to fill first and Michael Hollesen insists on getting serial N°2. We are both still waiting for the final Bakoon AMP-51R—the new 100wpc version—so I would hope to get a pair on a road trip to Co. Mayo by mid October. They will come in four flavours: Walnut with either anthracite or bronze mesh and a light Maple with the same mesh options. I also ended up with an 18" woofer which Chris felt would work the room better. I may still go with an upgraded filter version with Duelund caps/coils. Attached are some pics of the Walnut/dark grey (not final, it's too blue still) and I will get the maple/bronze version up and running in about three weeks."